A Grotto of our Lady of Lourdes is under construction from December 8, 2018 at St. Theresa's Parish at Kakkanour, in the archdiocese of Pondicherry, South India. 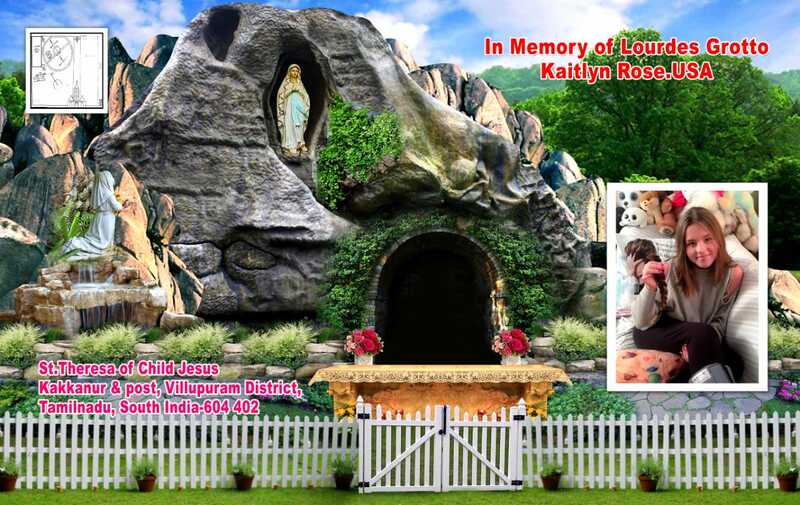 This Grotto is a vision of Deacon Jim Stahlnecker, Staten Island, New York to promote the sainthood of Kaitlyn Rose, a young angel who died of cancer in Brooklyn, New York on June 15, 2018. During her funeral mass at St. Bernard Parish in Brooklyn, it was considered to have this Grotto in memory of Kaitlyn. Father Ben Chinnappan is visiting St. Bernard Parish during the weekend of February 2-3, 2019 and celebrate the masses. Deacon Jim initiated the project now with his personal savings and generosity. The estimate of this project is under $ 30,000 and the Grotto will be blessed in February 2019. St. Theresa parishioners are very grateful for this Grotto as they are very devoted to Mother Mary and the Eucharist. The parishioners are willing to offer prayers everyday at the Grotto and pray for the sainthood of Kaitlyn. Father Ben Chinnappan, the founder of Dalit Solidarity, a tax-exempt charity in the US is coordinating this work along with Deacon Jim. This Grotto would be a huge blessing for the local people to live their faith very meaningfully. This will be also a source of evangelization for the people of other faith. As the work is in progress, we are looking for tax-deductible donations to speed up the work and complete it on time. Donors will be acknowledged at the Grotto with the honor or memory of your loved ones.